We all know Minnesota winter can get looooong (and it’s only January). 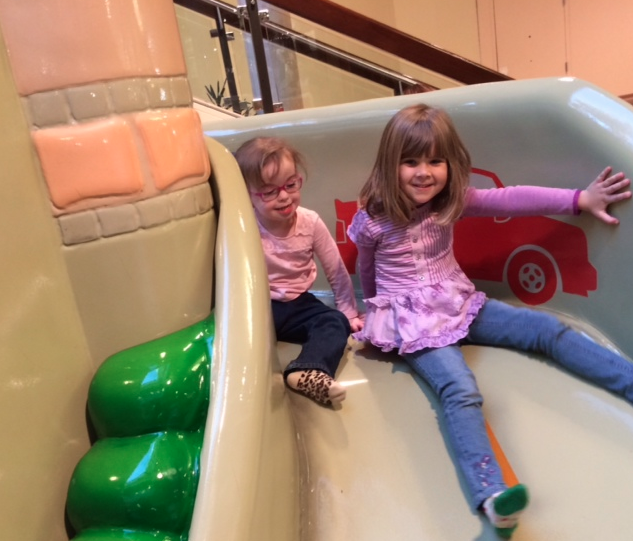 Last Saturday, my daughter and I met a friend and her daughters at the play place at the local mall for something fun to do out of the house. I’m pretty much always aware of the differences between my little love and other children – probably more so than I should be, a fault on my part – and Saturday was no exception. As we entered the play place, my daughter took it slow. She needs some time to process a new environment, even though she’s been there before. It was loud. It was colorful. There were many small bodies hurling themselves up ramps and down slides. I brace myself for the scream that comes when she is uncomfortable, and unable to communicate that feeling. As she warms up, I encourage her to go play, wanting her to get into the chasing games with other children. Or to go down a slide without coaxing from me. It takes my girlfriend and I half an hour to have a maybe 20 sentence conversation, because I am constantly bombarded with “Mama”s and a little hand outstretched to take me where she wants to go, because at three years old, she still can’t tell me. Seeing children of a similar age side by side with her increases my anxiety. On my good days, she has a disability and that’s just the way it is. On the bad days, I get lost in a tizzy of worries I’ve worried 100 times before. Today, it’s the mall related version. And about the days when peers are the ones who matter, and her family’s love, attention, and company isn’t enough to make her feel complete. What happens when she wants to walk around the mall alone, without being in arms reach of Mom’s hand? Will she be independent enough to do so? What happens if she wants to be a regular teenager, at the mall with girlfriends, like I so enjoyed doing? Will there be friends to get ice cream with, giggle obnoxiously with, just feel RIGHT with…will she find these companions, a group in which she fits? What happens when she wants to go shopping for a dress to wear to look pretty for a boy at a dance? Is this even in the developmental cards for her, and if it is, will a boy who makes sense for her exist? Will she ever know the nervous excitement of finding out that someone special likes her back? There is so much to worry about. So much beyond my control. So many things I want for her, so many pieces to fit into her own personal puzzle of a life fully lived. There is no question that her pieces will be different than your typical puzzle, and that is fine…but will there ever be enough? She snaps me out of my spiral with an enthusiastic “Mama! Mama! Mama!” and a tug at my arm. She drags me across the play place, excited to show me the G (her favorite letter) in the “NO PARKING” sign on the back of the “highway” slide. She has the G. She has Mama. And she is so happy. Today, at least for today, I am enough. I’ll cherish that for just a little while longer.